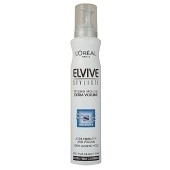 An innovation from L'Oréal haircare research, Elvive Styliste styling mousse range is an exclusive combination of care and hold. Extra Volume styling mousse with Ceramide R is designed to strengthen your hair and to offer a firm hold. - Your hair has visibly more lasting volume. - Your style looks perfect and really holds without stickiness. Aqua / Water, Alcohol Denat., Isobutane, Butane, Propane, Quaternium-87, Triacetin, Aminomethyl Propanol, Trideceth-12, Polyquaternium-4, Limonene, Vinyl Caprolactam/VP/Dimethylaminoethyl Methacrylate Copolymer, Benzyl Salicylate, Amodimethicone, 2-Oleamido-1, 3-Octadecanediol, Acrylates Copolymer, Butylphenyl Methylpropional, Cetrimonium Chloride, Citronellol, Hexyl Cinnamal, Parfum / Fragrance. Has good hold but not suitable for a person wishing curl definition. My local supermarket does not stock my favoured mousse, and I have used this when I can't get my usual brand. Even with a lot of the product to saturate the hair, I find that this product does not hold the curl together to make a good style. It is perhaps not designed to create this effect. Left hair looking like plastic, feeling like cardboard and my hair was not moveable. I used it no problem, but found it made my hair hard and not natural looking. "Has good hold but not suitable for a person wishing curl definition."